The iPhone travels with me everywhere I go. Most days it gets a lot of use from listening to music, taking photos, checking travel and weather reports, accessing email, diary, administering servers and my home (more on this later!) Some software on the phone drains the battery more than others, such as using it as a phone, or the GPS and Google Maps where data is constantly being downloaded. Often the iPhone struggles to even last the day without a top up or connection to my computer. Some days, this just doesn't happen as I'm constantly moving here there and everywhere. I know about the battery 'jackets' you can buy for the iPhone, but I hate them, mostly because they make the phone chunky and who wants to lose the beautiful design? No, I needed something I could just plug in, even momentarily and didn't rely on needed to be connected to the mains. There are hundreds of iPhone accessories out there, but few really make the grade. The Mobile Power Station seems to be a pretty smart solution. 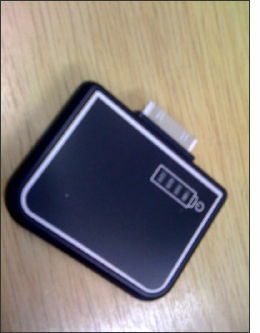 It has a dock plug which is simply connected to the bottom of the iPhone with a simple battery level indicator to show how much charge is left in the device. It charges the iPhone and on a full charge will completely charge the phone in about 30 minutes. Of course the phone still works albeit with something piggybacked onto it. When using Trailguru on the iPhone for tracking distance travelled on my bike this weekend, the iPhone rarely manages to complete a 2hr cycle because the GPS and screen power is just so draining for its battery. However, with the Mobile Power Station plugged into the iPhone which is mounted in the handlebar cradle it's just perfect. It's very inexpensive too. Charging is simple, simply connect to a standard iPod/iPhone charger and if piggybacked into the iPhone, the charger will charge both.